What did those Irish missionaries say to Richarius that made him give up what he knew and devote his life to Christ? As with many early medieval saints, information about the seventh century Frank also known as Riquier is scant and contradictory, but the stories are tantalizing. Whether they’re true is up to the reader. Richarius was born in a village then known as Centula in today’s France. Either he was working class guy who pursued rustic occupations or he was a nobleman, depending on which source you consult. With the events that follow, I think he was an aristocrat. Whatever his background, the visit of the two Irish missionaries, Caidoc and Fricor, changed his life. When the visitors arrived in Centula, they were mistreated by the locals. Except for Richarius, who offered his hospitality. After listening to their preaching, Richarius repented of his sins. So much that one story has him surviving only on barley bread strewn with ashes and water often mingled with his tears. Another has him offering protection to his guests so they could preach freely – something a nobleman could do. Richarius later became a priest providing relief for the sick and poor and redeeming captives. He spent few years as a missionary in Britain, then returned to Centula, where he founded a monastery around 625 and served as its first abbot. Such an accomplishment would be easier for a nobleman, especially if he already owned the property to give to the Church. Apparently, Richarius remained close to Caidoc and Fricor. They joined him at Centula and spent the rest of their lives there. As an abbot, Richarius would be in a position of influence. He had control over land, which was power in early medieval times, and could make alliances among fellow noblemen, both lay and clergy. In addition, the medieval populace believed that prayers from the monks could sway events here on earth, including who won the battles. During a visit from Frankish King Dagobert, Richarius impressed the monarch by giving him good advice, especially not to listen to flatterers, and the king rewarded him with a generous gift. Richarius could have kept his place as abbot for life. Or if illness prevented him from performing his duties, he could retire in relative comfort at the monastery. Instead when his health was failing, he traveled 15 miles away to a forest and lived in a hut with only one companion, Sigobart. Shortly before his death, believed to be April 26, 643, he told Sigobart to make a coffin. His grieving companion felled an oak in whose trunk the body was placed. The monks at Centula must have guessed that Richarius would soon be declared a saint, a decision of local bishops at the time, and took his relics back to the monastery. About 150 years later, that monastery, named St. Riquier, became a center for learning with Angilbert as its abbot. His close friend, Charlemagne, provided a golden shrine for the founder’s relics. 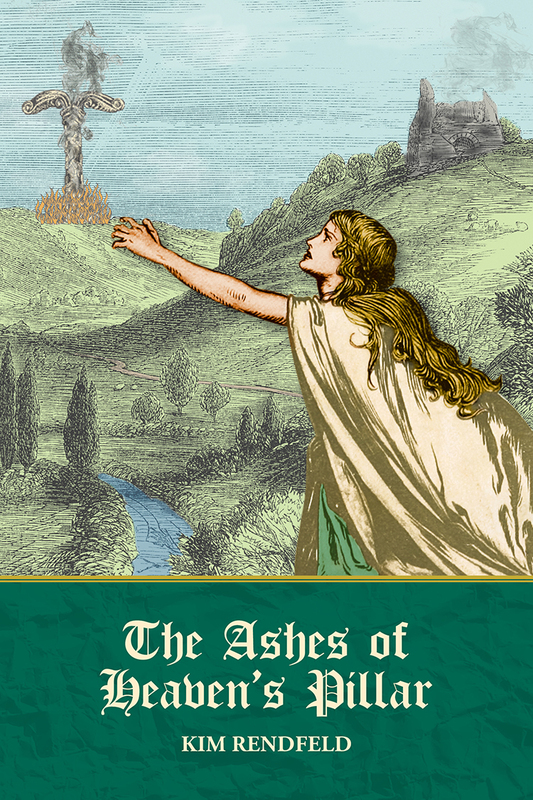 I had to research the monastery for The Ashes of Heaven’s Pillar, which has a few scenes taking place there 12 years before Angilbert becomes its abbot. During a trial, the characters swear on a piece of wood from a tree the monastery’s founder liked to rest under. This post was originally published on English Historical Fiction Authors on Oct. 19, 2014. Images are via Wikimedia Commons. What would Easter mean to an 8th century Saxon peasant who converted to Christianity with no education whatsoever? Especially if she was a slave in a foreign land and still learning the language? These are among the questions I explore in The Ashes of Heaven’s Pillar as my heroine, Leova, experiences the holy day for the first time. Her children are the only thing she has left. During Charlemagne’s first war in Saxony the previous summer, she lost everything—her husband, her home, her faith, her freedom. At this point in the story, Leova and her children have wound up in Nevers, where her master, Ragenard the merchant, lives. In that time, the folk spoke Roman, a form of Latin but not the language of the Church and very different from the Germanic Saxon language. I chose to call the holiday Pasch for a couple of reasons. 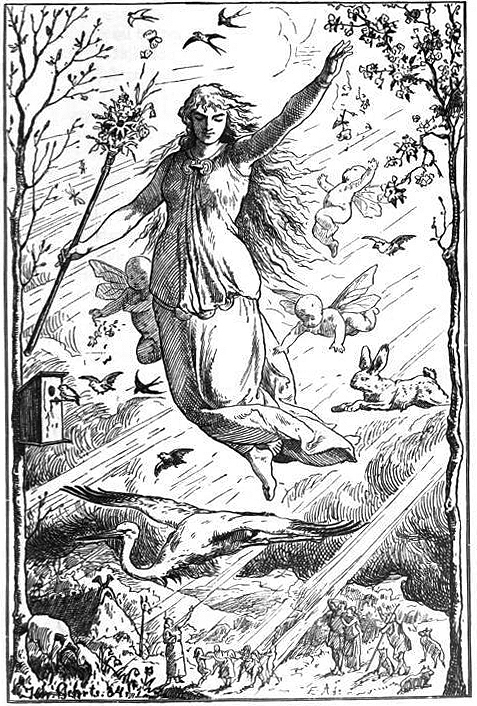 The word Easter is close to Eostre, a pagan goddess of spring. Pasch is similar to the French name for the holiday, and it comes to us from Anglo-French and Latin. The Christian rites continued to puzzle her. The week before a holy day called Pasch, which Sunwynn explained was the day Jesu rose from the dead, chanting monks and priests led a procession through the city and received long, thin leaves. Leova and her children followed with the rest of the faithful holding yew and willow twigs. Two days later, a priest visited the house, and for the next few mornings, Ragenard managed to dress and come to the hall. Yet it seemed as if even that small effort exhausted him. He spoke only a few pleasantries to Leova before returning to bed. Will he ever show fondness for me again? On the feast day, Ragenard attended Mass along with everyone else in the city, and the crowd overflowed down the steps. As the priests gave altar bread and wine to the faithful, Ragenard seemed barely able to stand. Another procession with priests holding crosses, censers, and several golden jeweled boxes followed. Ragenard looked like he would collapse. In the procession, the Roman buzz of gossip deepened Leova’s loneliness. On the temperate days like this in Eresburg, she and other wives had talked about their husbands and children and the upcoming Feast of Erda. The return of spring was empty here without the goddess. Leova longed for Derwine. He would have comforted her. Even if she and Ragenard were speaking to each other, Ragenard would not have understood. Travel in medieval times was often slow, unpleasant, and dangerous. At any time, someone could break a wheel, a person or animal could get sick, a storm could arrive suddenly, or brigands or demons could attack. You needed all the protection you could get and who better than Saint Christopher, a giant of a man so tough that only God was a worthy master? Belief in Christopher was so strong that just seeing his image assured the viewers that they would not die that day (or at least not faint or fall). He was popular everywhere, but churches in medieval England had the most murals with his image. Like many early saints, most of what we know about Christopher comes from legend. Originally named Offerus, he was a big guy and vowed to serve only a master who feared nothing. First, he served a king, but the king was afraid the devil. Then Offerus served the devil until the devil admitted he frightened by the cross. Offerus decided Christ was the master for him and met a hermit who instructed and baptized him. Renamed Christopher, he decided to serve God by carrying people to safety across a raging stream. One day, a child asked to be carried. No big deal, right? Well, the kid got heavy, so heavy Christopher feared he would drown. 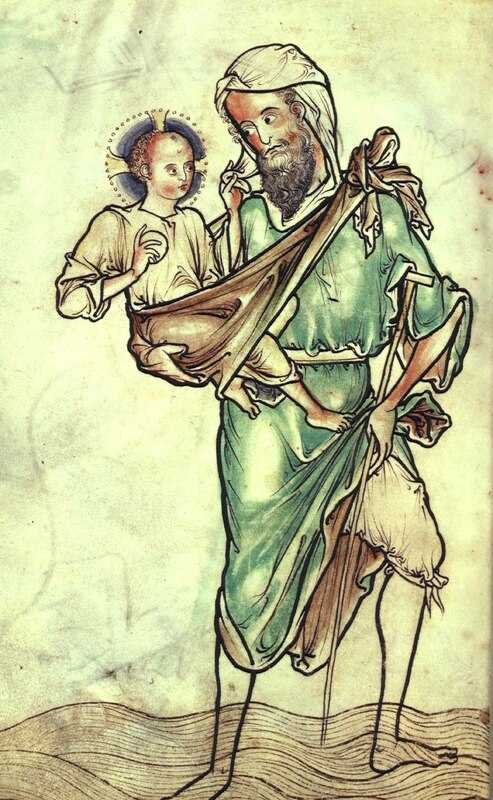 On the other side, Christopher asked the child why it felt like the world was on his shoulders, and the child revealed he was Christ and yes, he was carrying the whole world. To prove it, he told Christopher to plant his staff in the ground, and the next morning, it was a tree bearing flowers and dates. Christopher then decided to travel and preach and perform miracles, winning a lot of converts. But that’s when he got into trouble. The authorities were unhappy and had him tortured and executed. Over the centuries, the story has variations. As early as the fifth century, a church was dedicated to him, and in the eighth century, his legend was written in Greek and Latin. Its final form appears in the 13th-century Golden Legend. You could argue that Christopher’s story is an allegory of what it means to bear Christ in your heart and endure the trials of following the faith. But I suspect Christopher’s legend was true in the minds of medieval folk. Although Christopher wasn’t a knight and dragon-slayer like Saint George, he was a brave and strong man, one who helped ordinary people in the travails of travel. Perhaps that is why he captured the medieval imagination and is so beloved. 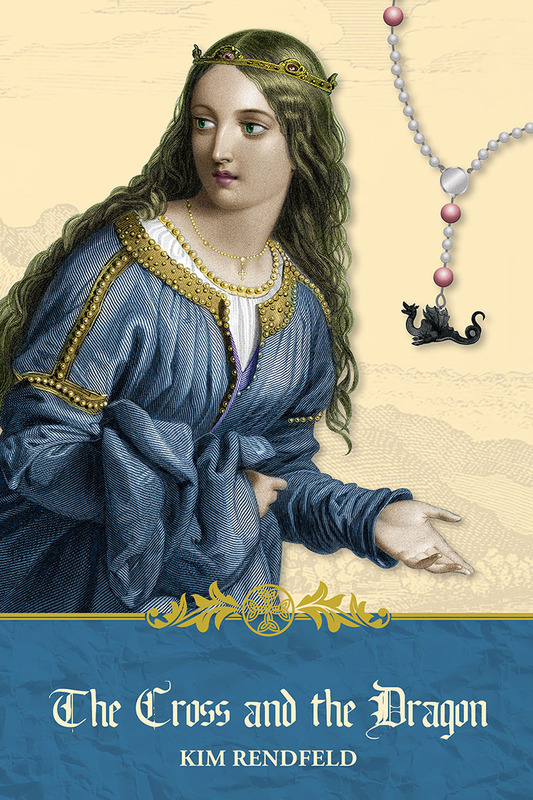 This post was originally published at English Historical Fiction Authors on Aug. 5, 2014.